Today only, save up to 40% off Ecovacs robot vacuums. For example this ECOVACS DEEBOT 601 Robotic Vacuum Cleaner with App Control, for Carpet & Optimized for Hard Floor, Max Mode, Quiet, Scheduling, Auto-Charging, Pet Friendly, Works with Amazon Alexa & Google Assistant is on sale for $189.99 (Retail $379.99). 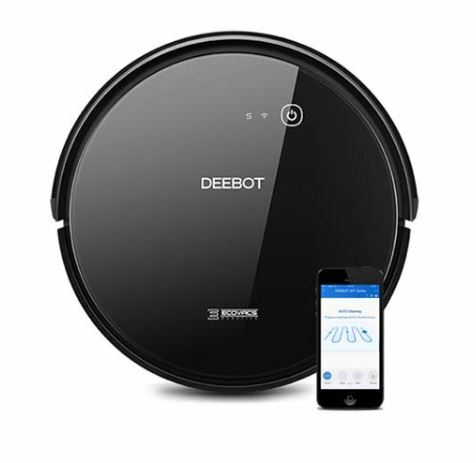 -OPTIMIZED NAVIGATION mode: DEEBOT 601 employs a more thorough, systematic wall-to-wall cleaning path when vacuuming hard floors to clean better and faster. -UP TO 120 MIN runtime with auto-return and charge to clean more and always be ready. -ANTI-DROP (STAIRS SAFETY) & anti-collision sensors to protect your furniture and prevent DEEBOT from falling downstairs. -LOW SOUND LEVEL to protect your home activities and pets. -SMART HOME: use Amazon Alexa & Google Assistant voice commands to start or stop cleaning, and to return to charging station. -ECOVACS Home App: customize, schedule & track cleaning sessions, monitor accessory status & receive notifications.